The kitchen catching light from south facing windows. On the kitchen table is the sustainable dinner set. A night shot of the living room. This angle as if you were standing in the pond. Our Bosch Oven supplied nicely by University Electric. The picture shown on our LED TV was actually taken by team member Ross Ruecker. 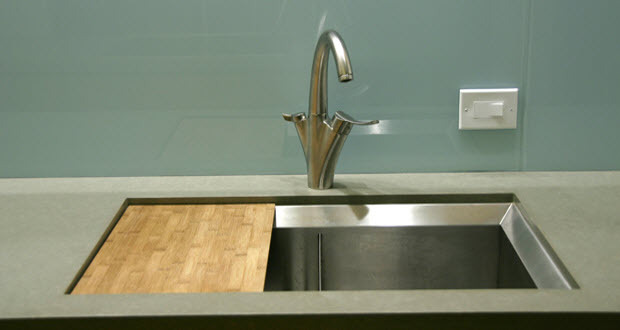 Our sink features a flush mounted Bamboo cutting board. It makes cleaning off veggie scraps really easy. The induction cooktop. The cooktop won't burn you if there are no pots. Refract house preserves the visual and physical connection to the outdoors through simple interior and exterior transitions spaces. Despite its advanced technology, the interior is simple, modern and comfortable. The house is filled with materials and products chosen from companies and individuals who have demonstrated their dedication to sustainable practices. The Vestfrost CP171SS is a split top refrigerator, bottom freezer that combines innovative technology for energy efficient cooling with a sleek, modern look. This stainless steel, slender refrigerator, only 2ft. wide by 2ft. deep, was designed with two compressors for independent cooling of the refrigerator and the freezer. The freezer uses three slide-out drawers to prevent temperature changes for when the door opens. This modern, energy efficient, and compact design works perfectly in the kitchen. With our Bosch 30in. induction cooktop we’ve changed the way we cook. Induction cooktops power a coil which uses high-frequency electromagnets. It isn’t until this electromagnetic field touches the metal of pots/pans that a circulating electric current occurs to generate heat. As a result, nothing outside of the cooking vessel is heated, and as soon as a pan is removed, heat generation ceases. Bosch’s “Safe Start Differential” feature recognizes pots, pans, and smaller items, and only heats up for cooking vessels for safety purposes (no one is burnt picking up a metal utensil for example). Bosch’s stainless steel specialty ventilation 30 in. downdraft fits perfectly with our induction cooktop on the kitchen’s island. With three different power levels, and internal blower, our ventilation downdraft quickly and quietly clears the air of cooking smoke and odors. When ventilation is not needed, the specialty downdraft lowers out of sight beneath the island counter. The contemporary stainless steel design of our Bosch 800 series 30 in. single wall oven continues the modern feel of Refract House. The oven features a flush to cabinetry design, as well as Bosch’s Clear Touch Glass Controls. As a European and New Speed convection oven, rather than letting air circulate randomly, our oven creates a uniform temperature by using internal fans to circulate the hot air. Ultimately, foods are cooked more quickly at lower temperatures, leading to energy savings. In addition, this particular model also features a two-hour EcoClean self-cleaning cycle. The dinner set titled Green Ware is designed and crafted by Travis McFlynn, a student at the California College of the Arts. The material used in the fabrication of the ceramic ware includes a blend of local California clay mined near Sacramento called ‘Happy Clay’. The glaze formulated for the ware consists of only three components: 70% recycled green tinted wine bottles ground in a ball mill to a fine powder called frit, 30% local clay, and the boiled juice from the vegetable Ochra is added to the glaze as a binder making it more fluid during application. The clay and glaze were developed by McFlynn's colleague John Toki, owner of Leslie Ceramic Supply Co.
Samsung’s LED TV Series 7 is transforming the television forever. Refract House features the 40in. LED HDTV (UN40B7000). This ultra-slim design, with soft, square lines, fits perfectly, recessed in the living room wall. The TV uses Advanced Color Processing to achieve a wider range of natural colors to give images a greater depth and more vibrant picture. Auto Motion technology eliminates virtually all motion blur, leaving a crisp image. The razor-thin silhouette, at only 1.2in. deep, allows for the TV to be hung just like a picture frame, less than two inches from the wall. Above all, this new LED TV uses 40% less power than a conventional LCD TV and is completely mercury free. Kohler’s Reve elongated toilet (K-3797) fits perfectly into our bathroom design. This honed white geometric design coordinates with the modern, clean look of the house. With its dual flush technology the toilet can be flushed at either 1.6 or .9 gallons, both low flow, energy efficient options. As a high-efficiency toilet, it provides significant water savings of up to 16,500 gallons per year compared to an older 3.5 gallon toilet. Kohler has also integrated the quiet-close toilet seat to this product, stopping the lid from slamming shut. The Duravit VeroWash bowl is a sophisticated design that sits flush on top of the bathroom’s built-in cabinet. The white finish of the sink provides a clean, simple look in the modern bathroom. The drain featured in the bathroom is very special. Quick Drain USA creates this low profile, linear shower drain for a clean look. This channel drain is available in many different lengths. In the Refract House, two 40in. long drains, covered by an 84in. stainless steel drain cover, run only 1 ½ in. wide beneath the shower glass partition.